I love that coconut water benefits offer healthy hydration all year round even if you don't live in the tropics. One of my favorite winter destinations has always been Costa Rica. The people are warm, the sound of the language delights the ears and the weather is hot and sunny. But one of the things I enjoyed the most when travelling to any tropical country is the fresh coconut water you can buy from local street vendors. There they would be with a cart of fresh coconuts, a handy machete, straws and a welcoming smile. Thanks to some smart innovators we can now enjoy this amazing beverage all year around for folks such as myself who don't live in the tropics, so fantastic. So what are coconut water benefits? All of the benefits and electrolytes listed above are great but I love that this beverage offers so much potassium. What does coconut water taste like? Well, it kind of taste both sweet and salty at the same time, though there is a tad more sweetness than salty (at least that's how it tastes to me). Does coconut water benefits really live up to all the hype? I see lots of celebrities enjoying coconut water in all kinds of ads lately, along with athletes who are also promoting this natural beverage. Claims have been made that this drink hydrates better than sports drinks, can help cure a hangover, is low in calories and can even help with disease prevention, but is any of this true? We know this beverage does help hydrate the body (so in the hangover department I can see how this would help), provides important electrolytes and lots of potassium. Regarding all the other claims that are being said to help sell coconut water, I don't think enough studies have been done yet to know anything as an absolute for sure. Does it make a good weight loss drink? There is no question that reaching out for coconut water is so much better than any sugary soda on a shelf. And when it comes to nutrition and calories this beverage will beat all the processed fruit juices too. So is it a healthy drink, most definitely. But there are a couple of things to take into consideration when drinking this wonderful beverage. So far I've been drinking the coconut water called Vita Coco which has 60 calories in 330 ml or 11 oz. Now personally I do not consider that to be super low in calories. So be aware that calories can add up quickly if you want to drink lots of this stuff. Coconut water benefits are great but this water can be quite pricey, so you may want to shop around before purchasing some. Depending on one's budget, you can enjoy this beverage daily or just occasionally as a treat. Coconut water is the clear liquid that comes from young green coconuts which is not the same as coconut milk, which is made from the white meat of the coconut. 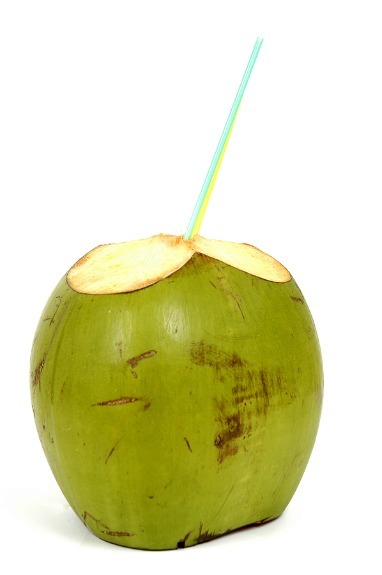 You can purchase coconut water on the internet from several companies including Amazon. If your shipping is free through Amazon that is usually the lower price. Also Costco carries it too but comparing pricing is always a good idea. I've only seen it on sale once and I'm glad I bought a little extra. So if you are interested keep your eyes peeled for sales and definitely more stores will start to carry this very popular product. I don't particularly look at brands per say, but it is important to try and buy coconut water that is "never from concentrate" and avoid ones that have added sugar. The more natural the better. So in a nutshell, if you would like to expand your choices of beverages and don't mind trying something a little different this is a nice healthy choice. Mainly because it helps hydrate the body so well, offers needed electrolytes and lots of potassium. So if you run out of bananas now you can have a new potassium substitute handy in your kitchen cupboard. It's nice to know.